This is a recipe that I’ve really been looking forward to making from Healthy Latin Cooking. We usually don’t make pork (Lisa’s not sure if she likes it) unless it’s in a stew, but after tonight’s meal I think we’ll be making it more often. The pork marinates in a delicious combination of chipotle peppers, citrus juices, garlic, and onions. I love how they explode in your mouth. Hey, this dish looks Christmas-y. This Other White Meat(tm) has so much flavor! Guess that’s what 24 hours of marinating gets you. Dammit, you have to stop making such delicious meals — I just eat and eat and eat! Place the pork in a shallow glass or ceramic baking dish. In a blender, combine the chipotles, garlic, onion, orange and lime juice, vinegar, oregano, and allspice; puree until smooth. Sppon the marinade over the pork. Cover and refrigerate for 12-24 hours. Turn 2 or 3 times while marinating. Preheat a grill or broiler to medium-high. Season the pork with salt and pepper. Grill or broil the pork for 6 to 8 minutes per side, or until the internal temperature reaches 160F. Let the pork sit for 3 minutes before slicing on the diagonal. Mound a portion of salsa on each of 4 dinner plates. Divide the pork among the plates; dollop sour cream over the pork. Sprinkle with pomegranate seeds. Hmmmm, first time using pomegranate seeds in a dish, I guess I should submit this to this week’s Weekend Herb Blogging! This entry was posted on Thursday, December 6th, 2007 at 10:54 pm	and is filed under Healthy Latin Cooking, Main Dishes. You can follow any responses to this entry through the RSS 2.0 feed. You can leave a response, or trackback from your own site. The pomegranate seeds provide a really great touch to an appetizing dish. This is such a delish combo. Pork, yum. Chipotles, double yum. Pomegranates, I’m making this recipe! Thanks! 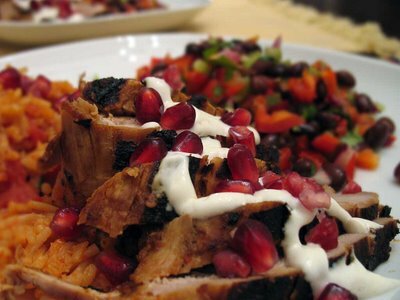 I haven’t used pomegranate seeds much in savory dishes, but this sounds great. your pics are great and this looks quite tasty! Simona — they really did add a nice sweetness and tartness that contrasted nicely with the pork! Kalyn — This was actually the first pomegranate I had ever personally opened. Sophie — thanks for the compliment, and if you haven’t figured it out from the rest of my comments, it was indeed tasty! Chipotle and pomegranate . . . what a fun combination!